For other uses, see Resurrection (disambiguation). Resurrection or anastasis is the concept of coming back to life after death. In a number of ancient religions, a dying-and-rising god is a deity which dies and resurrects. The resurrection of the dead is a standard eschatological belief in the Abrahamic religions. As a religious concept, it is used in two distinct respects: a belief in the resurrection of individual souls that is current and ongoing (Christian idealism, realized eschatology), or else a belief in a singular resurrection of the dead at the end of the world. Some believe the soul is the actual vehicle by which people are resurrected. The death and resurrection of Jesus, an example of resurrection, is the central focus of Christianity. Christian theological debate ensues with regard to what kind of resurrection is factual – either a spiritual resurrection with a spirit body into Heaven, or a material resurrection with a restored human body. While most Christians believe Jesus' resurrection from the dead and ascension to Heaven was in a material body, a very small minority believes it was spiritual. There are documented rare cases of the return to life of the clinically dead which are classified scientifically as examples of the Lazarus syndrome, a term originating from the biblical story of the resurrection of Lazarus. Resurrection, from the Latin noun resurrectio -onis, from the verb rego, "to make straight, rule" + preposition sub, "under", altered to subrigo and contracted to surgo, surrexi, surrectum ("to rise", "get up", "stand up") + preposition re-, "again", thus literally "a straightening from under again". In ancient Greek religion a number of men and women were made physically immortal as they were resurrected from the dead. 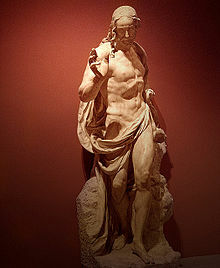 Asclepius was killed by Zeus, only to be resurrected and transformed into a major deity. Achilles, after being killed, was snatched from his funeral pyre by his divine mother Thetis and resurrected, brought to an immortal existence in either Leuce, Elysian plains or the Islands of the Blessed. Memnon, who was killed by Achilles, seems to have received a similar fate. Alcmene, Castor, Heracles, and Melicertes, were also among the figures sometimes considered to have been resurrected to physical immortality. According to Herodotus's Histories, the seventh century BC sage Aristeas of Proconnesus was first found dead, after which his body disappeared from a locked room. Later he found not only to have been resurrected but to have gained immortality. Many other figures, like a great part of those who fought in the Trojan and Theban wars, Menelaus, and the historical pugilist Cleomedes of Astupalaea, were also believed to have been made physically immortal, but without having died in the first place. Indeed, in Greek religion, immortality originally always included an eternal union of body and soul. The philosophical idea of an immortal soul was a later invention, which, although influential, never had a breakthrough in the Greek world. As may be witnessed even into the Christian era, not least by the complaints of various philosophers over popular beliefs, traditional Greek believers maintained the conviction that certain individuals were resurrected from the dead and made physically immortal and that for the rest of us, we could only look forward to an existence as disembodied and dead souls. This traditional religious belief in physical immortality was generally denied by the Greek philosophers. Writing his Lives of Illustrious Men (Parallel Lives) in the first century, the Middle Platonic philosopher Plutarch's chapter on Romulus gave an account of the mysterious disappearance and subsequent deification of this first king of Rome, comparing it to traditional Greek beliefs such as the resurrection and physical immortalization of Alcmene and Aristeas the Proconnesian, "for they say Aristeas died in a fuller's work-shop, and his friends coming to look for him, found his body vanished; and that some presently after, coming from abroad, said they met him traveling towards Croton." Plutarch openly scorned such beliefs held in traditional ancient Greek religion, writing, "many such improbabilities do your fabulous writers relate, deifying creatures naturally mortal." "Therefore having overlooked the times of ignorance, God is now declaring to men that all everywhere should repent, because He has fixed a day in which He will judge the world in righteousness through a Man whom He has appointed, having furnished proof to all men by raising Him from the dead." Now when they heard of the resurrection of the dead, some began to sneer, but others said, `We shall hear you again concerning this.'" During the period of the Second Temple, there developed a diversity of beliefs concerning the resurrection. The concept of resurrection of the physical body is found in 2 Maccabees, according to which it will happen through recreation of the flesh. Resurrection of the dead also appears in detail in the extra-canonical books of Enoch, in Apocalypse of Baruch, and 2 Esdras. According to the British scholar in ancient Judaism Philip R. Davies, there is “little or no clear reference … either to immortality or to resurrection from the dead” in the Dead Sea scrolls texts. Both Josephus and the New Testament record that the Sadducees did not believe in an afterlife, but the sources vary on the beliefs of the Pharisees. The New Testament claims that the Pharisees believed in the resurrection, but does not specify whether this included the flesh or not. According to Josephus, who himself was a Pharisee, the Pharisees held that only the soul was immortal and the souls of good people will “pass into other bodies,” while “the souls of the wicked will suffer eternal punishment.” Paul, who also was a Pharisee, said that at the resurrection what is "sown as a natural body is raised a spiritual body." Jubilees seems to refer to the resurrection of the soul only, or to a more general idea of an immortal soul. According to Herbert C. Brichto, writing in Reform Judaism's Hebrew Union College Annual, the family tomb is the central concept in understanding biblical views of the afterlife. Brichto states that it is "not mere sentimental respect for the physical remains that is...the motivation for the practice, but rather an assumed connection between proper sepulture and the condition of happiness of the deceased in the afterlife". According to Brichto, the early Israelites apparently believed that the graves of family, or tribe, united into one, and that this unified collectivity is to what the Biblical Hebrew term Sheol refers, the common Grave of humans. Although not well defined in the Tanakh, Sheol in this view was a subterranean underworld where the souls of the dead went after the body died. The Babylonians had a similar underworld called Aralu, and the Greeks had one known as Hades. For biblical references to Sheol see Genesis 42:38, Isaiah 14:11, Psalm 141:7, Daniel 12:2, Proverbs 7:27 and Job 10:21,22, and 17:16, among others. According to Brichto, other Biblical names for Sheol were: Abaddon (ruin), found in Psalm 88:11, Job 28:22 and Proverbs 15:11; Bor (the pit), found in Isaiah 14:15, 24:22, Ezekiel 26:20; and Shakhat (corruption), found in Isaiah 38:17, Ezekiel 28:8. In Christianity, resurrection most critically concerns the resurrection of Jesus, but also includes the resurrection of Judgment Day known as the resurrection of the dead by those Christians who subscribe to the Nicene Creed (which is the majority or Mainstream Christianity), as well as the resurrection miracles done by Jesus and the prophets of the Old Testament (see Judaism and Samaritanism below). If only for this life we have hope in Christ, we are to be pitied more than all men. But Christ has indeed been raised from the dead, the first fruits of those who have fallen asleep. The Resurrection of Lazarus, painting by Leon Bonnat, France, 1857. During the Ministry of Jesus on earth, before his death, Jesus commissioned his Twelve Apostles to, among other things, raise the dead. In the New Testament, Jesus is said to have raised several persons from death. These resurrections included the daughter of Jairus shortly after death, a young man in the midst of his own funeral procession, and Lazarus, who had been buried for four days. According to the Gospel of Matthew, after Jesus's resurrection, many of those previously dead came out of their tombs and entered Jerusalem, where they appeared to many. Similar resurrections are credited to the apostles and Catholic saints. In the Acts of the Apostles, Saint Peter raised a woman named Dorcas (also called Tabitha), and Paul the Apostle revived a man named Eutychus who had fallen asleep and fell from a window to his death. Following the Apostolic Age, many saints were said to resurrect the dead, as recorded in Orthodox Christian hagiographies. St Columba supposedly raised a boy from the dead in the land of Picts. Christianity started as a religious movement within 1st-century Judaism (late Second Temple Judaism), and it retains what the New Testament itself claims was the Pharisaic belief in the afterlife and Resurrection of the Dead. Whereas this belief was only one of many beliefs held about the World to Come in Second Temple Judaism, and was notably rejected by both the Sadducees and, according to Josephus, the Pharisees, this belief became dominant within Early Christianity and already in the Gospels of Luke and John included an insistence on the resurrection of the flesh. Most modern Christian churches continue to uphold the belief that there will be a final resurrection of the dead and World to Come, perhaps as prophesied by the Apostle Paul when he said: "...he hath appointed a day, in the which he will judge the world..." (Acts 17:31 KJV) and "...there shall be a resurrection of the dead, both of the just and unjust." (Acts 24:15 KJV). Belief in the resurrection of the dead, and Jesus' role as judge, is codified in the Apostles' Creed, which is the fundamental creed of Christian baptismal faith. The Book of Revelation also makes many references about the Day of Judgment when the dead will be raised. In Platonic philosophy and other Greek philosophical thought, at death the soul was said to leave the inferior body behind. The idea that Jesus was resurrected spiritually rather than physically even gained popularity among some Christian teachers, whom the author of 1 John declared to be antichrists. Similar beliefs appeared in the early church as Gnosticism. However, in Luke 24:39, the resurrected Jesus expressly states "behold my hands and my feet, that it is I myself. Handle me and see, for a spirit does not have flesh and bones as you see I have." There are folklore, stories, and extractions from certain holy texts that refer to resurrections. One major folklore is that of Savitri saving her husband's life from Yamraj. In the Ramayana, after Ravana was slayed by Rama in a great battle between good and evil, Rama requests the king of Gods, Indra, to restore the lives of all the monkeys who died in the great battle. There are stories in Buddhism where the power of resurrection was allegedly demonstrated in Chan or Zen tradition. One is the legend of Bodhidharma, the Indian master who brought the Ekayana school of India to China that subsequently became Chan Buddhism. The other is the passing of Chinese Chan master Puhua (J., Fuke) and is recounted in the Record of Linji (J., Rinzai). Puhua was known for his unusual behavior and teaching style so it is no wonder that he is associated with an event that breaks the usual prohibition on displaying such powers. Here is the account from Irmgard Schloegl's "The Zen Teaching of Rinzai". "One day at the street market Fuke was begging all and sundry to give him a robe. Everybody offered him one, but he did not want any of them. The master [Linji] made the superior buy a coffin, and when Fuke returned, said to him: "There, I had this robe made for you." Fuke shouldered the coffin, and went back to the street market, calling loudly: "Rinzai had this robe made for me! I am off to the East Gate to enter transformation" (to die)." The people of the market crowded after him, eager to look. Fuke said: "No, not today. Tomorrow, I shall go to the South Gate to enter transformation." And so for three days. Nobody believed it any longer. On the fourth day, and now without any spectators, Fuke went alone outside the city walls, and laid himself into the coffin. He asked a traveler who chanced by to nail down the lid. The news spread at once, and the people of the market rushed there. On opening the coffin, they found that the body had vanished, but from high up in the sky they heard the ring of his hand bell." Cryonics is the low-temperature preservation of humans who cannot be sustained by contemporary medicine, with the hope that healing and resuscitation may be possible in the future. Cryonics procedures ideally begin within minutes of cardiac arrest, and use cryoprotectants to prevent ice formation during cryopreservation. However, the idea of cryonics also includes preservation of people long after death because of the possibility that brain encoding memory structure and personality may still persist or be inferable in the future. Whether sufficient brain information still exists for cryonics to successfully preserve may be intrinsically unprovable by present knowledge. Therefore, most proponents of cryonics see it as an intervention with prospects for success that vary widely depending on circumstances. Russian Cosmist Nikolai Fyodorovich Fyodorov advocated resurrection of the dead using scientific methods. Fedorov tried to plan specific actions for scientific research of the possibility of restoring life and making it infinite. His first project is connected with collecting and synthesizing decayed remains of dead based on "knowledge and control over all atoms and molecules of the world". The second method described by Fedorov is genetic-hereditary. The revival could be done successively in the ancestral line: sons and daughters restore their fathers and mothers, they in turn restore their parents and so on. This means restoring the ancestors using the hereditary information that they passed on to their children. Using this genetic method it is only possible to create a genetic twin of the dead person. It is necessary to give back the revived person his old mind, his personality. Fedorov speculates about the idea of "radial images" that may contain the personalities of the people and survive after death. Nevertheless, Fedorov noted that even if a soul is destroyed after death, Man will learn to restore it whole by mastering the forces of decay and fragmentation. In his 1994 book The Physics of Immortality, American physicist Frank J. Tipler, an expert on the general theory of relativity, presented his Omega Point Theory which outlines how a resurrection of the dead could take place at the end of the cosmos. He posits that humans will evolve into robots which will turn the entire cosmos into a supercomputer which will, shortly before the big crunch, perform the resurrection within its cyberspace, reconstructing formerly dead humans (from information captured by the supercomputer from the past light cone of the cosmos) as avatars within its metaverse. David Deutsch, British physicist and pioneer in the field of quantum computing, agrees with Tipler's Omega Point cosmology and the idea of resurrecting deceased people with the help of quantum computers but he is critical of Tipler's theological views. Italian physicist and computer scientist Giulio Prisco presents the idea of "quantum archaeology", "reconstructing the life, thoughts, memories, and feelings of any person in the past, up to any desired level of detail, and thus resurrecting the original person via 'copying to the future'". In his book Mind Children, roboticist Hans Moravec proposed that a future supercomputer might be able to resurrect long-dead minds from the information that still survived. For example, this information can be in the form of memories, filmstrips, medical records, and DNA. Ray Kurzweil, American inventor and futurist, believes that when his concept of singularity comes to pass, it will be possible to resurrect the dead by digital recreation. In their science fiction novel The Light of Other Days, Sir Arthur Clarke and Stephen Baxter imagine a future civilization resurrecting the dead of past ages by reaching into the past, through micro wormholes and with nanorobots, to download full snapshots of brain states and memories. Both the Church of Perpetual Life and the Terasem Movement consider themselves transreligions and advocate for the use of technology to indefinitely extend the human lifespan. As knowledge of different religions has grown, so have claims of bodily disappearance of some religious and mythological figures. In ancient Greek religion, this was a way the gods made some physically immortal, including such figures as Cleitus, Ganymede, Menelaus, and Tithonus. After his death, Cycnus was changed into a swan and vanished. In his chapter on Romulus from Parallel Lives, Plutarch criticises the continuous belief in such disappearances, referring to the allegedly miraculous disappearance of the historical figures Romulus, Cleomedes of Astypalaea, and Croesus. In ancient times, Greek and Roman pagan similarities were explained by the early Christian writers, such as Justin Martyr, as the work of demons, with the intention of leading Christians astray. In the Epic of King Gesar, Geesar, at the end, chants on a mountain top and his clothes fall empty to the ground. The body of the first Guru of the Sikhs, Guru Nanak Dev, is said to have disappeared and flowers left in place of his dead body. Lord Raglan's Hero Pattern lists many religious figures whose bodies disappear, or have more than one sepulchre. B. Traven, author of The Treasure of the Sierra Madre, wrote that the Inca Virococha arrived at Cusco (in modern-day Peru) and the Pacific seacoast where he walked across the water and vanished. It has been thought that teachings regarding the purity and incorruptibility of the hero's human body are linked to this phenomenon. Perhaps, this is also to deter the practice of disturbing and collecting the hero's remains. They are safely protected if they have disappeared. The first such case mentioned in the Bible is that of Enoch (son of Jared, great-grandfather of Noah, and father of Methuselah). Enoch is said to have lived a life where he "walked with God", after which "he was not, for God took him" (Genesis 5:1–18). In Deuteronomy (34:6) Moses is secretly buried. Elijah vanishes in a whirlwind 2 Kings (2:11). After hundreds of years these two earlier Biblical heroes suddenly reappear, and are seen walking with Jesus, then again vanish. Mark (9:2–8), Matthew (17:1–8) and Luke (9:28–33). The last time he is seen, Luke (24:51) alone tells of Jesus leaving his disciples by ascending into the sky. ^ "Gregory of Nyssa: "On the Soul and the Resurrection:" However far from each other their natural propensity and their inherent forces of repulsion urge them, and debar each from mingling with its opposite, none the less will the soul be near each by its power of recognition, and will persistently cling to the familiar atoms, until their concourse after this division again takes place in the same way, for that fresh formation of the dissolved body which will properly be, and be called, resurrection". Ccel.org. ^ As in the Apostle's Creed: "I believe in the Holy Spirit, the holy catholic Church, the communion of saints, the forgiveness of sins, the resurrection of the body, and life everlasting." Catholic Encyclopedia: General Resurrection: "Resurrection is the rising again from the dead, the resumption of life. The Fourth Lateran Council (1215) teaches that all men, whether elect or reprobate, "will rise again with their own bodies which they now bear about with them" (chapter "Firmiter"). 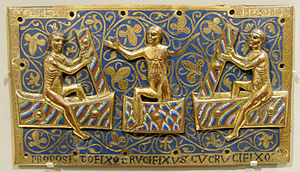 In the language of the creeds and professions of faith this return to life is called resurrection of the body (resurrectio carnis, resurrectio mortuoram, anastasis ton nekron) for a double reason: first, since the soul cannot die, it cannot be said to return to life; second the heretical contention of Hymeneus and Philitus that the Scriptures denote by resurrection not the return to life of the body, but the rising of the soul from the death of sin to the life of grace, must be excluded." ^ Symes, R. C. "According to Paul of Tarsus, the resurrection transformed Jesus into the Christ, the Son of God and Savior of the world. Christ's resurrected body was not a resuscitated physical body, but a new body of a spiritual/celestial nature: the natural body comes first and then the spiritual body (1 Cor. 15:46). Paul never says that the earthly body becomes immortal". religioustolerance.org. ^ The Watchtower Society claims that Jesus was not raised in His actual physical human body, but rather was raised as an invisible spirit being—what He was before, the archangel Michael. They believe that Christ's post-Resurrection appearances on earth were on-the-spot manifestations and materializations of flesh and bones, with different forms, that the Apostles did not immediately recognize. Their explanation for the statement "a spirit hath not flesh and bones" is that Christ was saying that he was not a ghostly apparition, but a true materialization in flesh, to be seen and touched, as proof that he was actually raised. But that, in fact, the risen Christ was, in actuality, a divine spirit being, who made himself visible and invisible at will. The Christian Congregation of Jehovah’s Witnesses believes that Christ’s perfect manhood was forever sacrificed at Calvary, and that it was not actually taken back. They state: "...in his resurrection he ‘became a life-giving spirit.’ That was why for most of the time he was invisible to his faithful apostles... He needs no human body any longer... The human body of flesh, which Jesus Christ laid down forever as a ransom sacrifice, was disposed of by God’s power. "—Things in Which it is Impossible for God to Lie, pages 332, 354. ^ "Resurrection Theories". Gospel-mysteries.net. Retrieved 2013-05-04. ^ Sir James Frazer (1922). The Golden Bough: A Study in Magic and Religion Ware: Wordsworth 1993. ^ Jonathan Z. Smith "Dying and Rising Gods" in Mircea Eliade (ed.) The Encyclopedia of Religion: Vol. 3. New York: Simon & Schuster Macmillan 1995: 521-27. ^ Mettinger, Riddle of Resurrection, 55-222. ^ "Acts 17:30-32". Biblegateway.com. Retrieved 2013-05-04. ^ 2 Maccabees 7.11, 7.28. ^ 1 Enoch 61.5, 61.2. ^ Philip R. Davies. “Death, Resurrection and Life After Death in the Qumran Scrolls” in Alan J. Avery-Peck & Jacob Neusner (eds.) Judaism in Late Antiquity: Part Four: Death, Life-After-Death, Resurrection, and the World-To-Come in the Judaisms of Antiquity. Leiden 2000:209. ^ Josephus Antiquities 18.16; Matthew 22.23; Mark 12.18; Luke 20.27; Acta 23.8. ^ Josephus Jewish War 2.8.14; cf. Antiquities 8.14-15. ^ Raphael, Simcha Paull (2009). Jewish Views of the Afterlife. Lanham, MD: Rowman & Littlefield. p. 45. ISBN 9780742562202. ^ Not in the Great Commission of the resurrected Jesus, but only in the so-called Lesser Commission of Matthew, specifically Matthew 10:8. "Avicenna". Encyclopaedia of Islam Online. : Ibn Sīnā, Abū ʿAlī al-Ḥusayn b. ʿAbd Allāh b. Sīnā is known in the West as "Avicenna". ^ Schloegl, Irmgard; tr. "The Zen Teaching of Rinzai". Shambhala Publications, Inc., Berkeley, 1976. Page 76. ISBN 0-87773-087-3. ^ "What is Cryonics?". Alcor Foundation. Retrieved 2 December 2013. "Cryonics is an effort to save lives by using temperatures so cold that a person beyond help by today's medicine might be preserved for decades or centuries until a future medical technology can restore that person to full health." ^ Best, B. P. (April 2008). "Scientific justification of cryonics practice". Rejuvenation Research. 11 (2): 493–503. doi:10.1089/rej.2008.0661. PMC 4733321. PMID 18321197. ^ Nikolai Berdyaev, The Religion of Resusciative Resurrection. "The Philosophy of the Common Task of N. F. Fedorov. ^ Frank J. Tipler, The Physics of Immortality: Modern Cosmology, God and the Resurrection of the Dead (New York: Doubleday, 1994), ISBN 0198519494. 56-page excerpt available here. ^ David Deutsch (1997). "The Ends of the Universe". The Fabric of Reality: The Science of Parallel Universes—and Its Implications. London: Penguin Press. ISBN 0-7139-9061-9. ^ Giulio Prisco (October 11, 2015). "Technological Resurrection Concepts From Fedorov to Quantum Archeology". Institute for Ethics and Emerging Technologies. Retrieved December 10, 2015. Giulio Prisco (December 16, 2011). "Quantum Archaeology". Retrieved 6 July 2015. ^ Moravec, Hans (1988). Mind Children. ISBN 9780674576186. Retrieved 6 July 2015. ^ "Resurrecting the Dead - Futurisms - The New Atlantis". Futurisms - The New Atlantis. Retrieved 6 July 2015. ^ Socrates (18 July 2012). "Ray Kurzweil on the Singularity and Bringing Back the Dead". Singularity Weblog. Retrieved 6 July 2015. ^ Arthur C. Clarke, Profiles of the Future: An Inquiry into the Limits of the Possible, Millennium [i.e., Second] Edition, Victor Gollancz – An imprint of Orion Books Ltd., 1999, p. 118: "the novel that Stephen Baxter has now written from my synopsis — The Light of Other Days." ^ Anthony Cuthbertson (December 9, 2015). "Virtual reality heaven: How technology is redefining death and the afterlife". International Business Times. Retrieved December 10, 2015. ^ Erwin Rohde Psyche: The Cult of Souls and Belief in Immortality among the Greeks. New York: Harper & Row 1966. ^ Alexandra David-Neel,and Lama Yongden, The Superhuman Life of Gesar of Ling, Rider, 1933, While still in oral tradition, it is recorded for the first time by an early European traveler. C.D. Elledge. Resurrection of the Dead in Early Judaism, 200 BCE -- CE 200. Oxford: Oxford University Press, 2017. Nikolai Fyodorovich Fyodorov. Philosophy of Physical Resurrection 1906. Edwin Hatch. Influence of Greek Ideas and Usages Upon the Christian Church (1888 Hibbert Lectures). Lange, Dierk. "The dying and the rising God in the New Year Festival of Ife", in: Lange, Ancient Kingdoms of West Africa, Dettelbach: Röll Vlg. 2004, pp. 343–376. Richard Longenecker, editor. Life in the Face of Death: The Resurrection Message of the New Testament. Grand Rapids: Eerdmans, 1998. Tryggve Mettinger. The Riddle of Resurrection: "Dying and Rising Gods" in the Ancient Near East, Stockholm: Almqvist 2001. Markus Mühling. Grundinformation Eschatologie. Systematische Theologie aus der Perspektive der Hoffnung. Göttingen: Vandenhoeck & Ruprecht, 2007, ISBN 978-3-8252-2918-4, 242–262. George Nickelsburg. Resurrection, Immortality, and Eternal Life in Intertestmental Judaism. Cambridge: Harvard University Press, 1972. Pheme Perkins. Resurrection: New Testament Witness and Contemporary Reflection. Garden City: Doubleday & Company, 1984. Erwin Rohde Psyche: The Cult of Souls and Belief in Immortality among the Greeks. New York: Harper & Row, 1925 . Frank J. Tipler (1994). The Physics of Immortality: Modern Cosmology, God and the Resurrection of the Dead. my house: Doubleday. ISBN 0-19-851949-4. Wikimedia Commons has media related to Resurrection. "Resurrection". Internet Encyclopedia of Philosophy. Article on resurrection in the Hebrew Bible. Rethinking the resurrection. (of Jesus Christ)(Cover Story) Newsweek, April 8th 1996, Woodward, Kenneth L.